Water glass or sodium silicate is formed by melting quartz sand with sodium carbonate at high temperatures. Sodium silicate may then be either available as solid matter or as silicate binder dissolved in water. From the reaction equation for the production of water glass shown in figure 1 it can be concluded that, simply said, water glass is dissolved quartz sand. The silicon atom is available in the chemical structure of water glass at a central point surrounded by four bonding partners. The groups which could bond to the silicon atom are either neutral silanol groups (Si-OH) or their alkali salts (Si-ONa). Since one characteristic of water glass is its strong alkaline reaction in water solutions, there are mainly Si-ONa groups available in water glass. 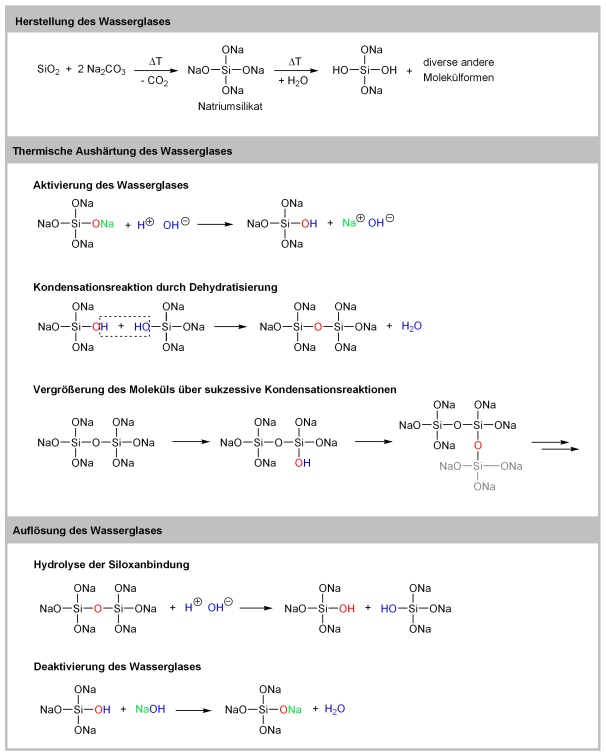 With regard to water glasssolidification, these groups are rather unreactive but enter various reactions in water solution. The reaction with water transforms the alkali salt into a silanol group. This silanol group is very reactive in alkali solutions entering a condensation reactions with other silanol groups under dehydration. In this process, a new chemical bond between two water glass molecules is formed. By repeating this reaction sequence, new siloxane bonds (Si-O-Si) are formed and the molecule is continuously enlarged. Conversely, the formed siloxane bonds can be split by water and lye, and the molecule is diminished by this back reaction. Moreover, alkali salt can be generated from a silanole group by the reaction with lye. In simple terms, water glass is deactivated in this reaction. Comparing the reaction steps in figure 1 for thermal hardening and dissolution of water glass, you can see that they are identical but in reverse order. Without external influences on the system, in a closed vessel, there is a balance of all individual bonds and molecules, and the condition of water glass is unchanged. If the external conditions are changed, e.g. by dehydration (s. Dehydration) or by gassing with CO2during core or mold production, the chemical balance starts shifting towards molecular enlargement. This mechanism is described by Iller on the basis of the example of an aqueous silicon dioxide solution and can be transferred to water glass. At first, individual monomers are aggregated to form dimers etc., and finally they form larger molecules by gradual condensation reactions. Molecules with a diameter of at least 1 nm are referred to as particles. For hardening (s. a. Hardening), two different reactions are possible (figure 2). Either the individual particles are continuously enlarged, or they cumulate to form chains and networks. In both steps, the chemical reaction mechanism is the same - new siloxane bonds are made under dehydration by condensation reactions between individual silanol groups. The kind of hardening is considerably influenced by the pH value of the solution. Reaction A is favored for low pH values. The reaction speed in this case is slow enough that ordered homogenous structures can be formed. Converging particles agglomerate and form a porous branched gel structure. 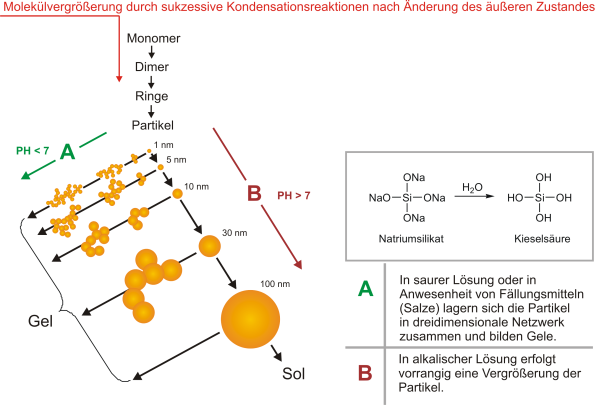 If the aqueous silicon dioxide has a pH value of 7 and more, reaction B takes place forming so-called sol structures. The speed of molecular enlargement at a high pH value is so high that there is mainly this reaction beside the formation of gel structures.